Ann is four years old and her preschool class went to a local "take and bake" pizza place where they were able to make their own pizzas. The store was crazy enough to allow the four year olds to make their own crust as well as add toppings. The crust was very thick in places and even thicker in others. Most the toppings had gotten the hint from gravity and found a home in between the two mountains of dough. Some of the more stubborn toppings held on to the sides in some sad show of bravado. 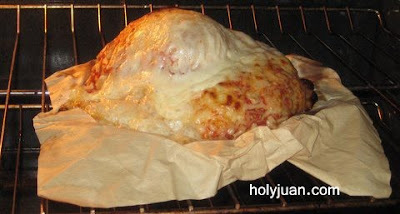 We tossed the creation in the oven per the instructions and waited. I'm not sure if a stray gamma ray hit a still thriving colony of yeast, but the crust came alive and tried to negotiate its way out of the oven. 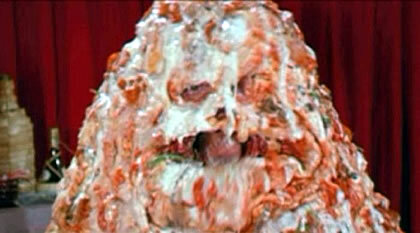 It reminded me of this character from "Space Balls." We turned up the heat until it stopped talking. Ann ate about three bites. One of the other parents at my school asked if we tried to poison them with this pizza. I just fell out of my chair laughing. This is awesome! OMG!! This is the funniest thing I've seen all day!! Thank you for the hardy laugh!